Alba : for solo piano / by Tim Dargaville. 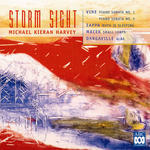 Storm sight / Michael Kieran Harvey. Book: Australian piano music 1980-2010 from a pianist's perspective : a presentation of two performance events / Rohan David Murray. Nov 95: ABC FM. Featuring Michael Kieran Harvey.